This week’s Parshah, though couched in terminology that may seem unfamiliar to modern ears, deals with issues that are relevant to any age—issues of guilt and redress, wrong-doing and atonement. In our day, the atonement offering (and all other offerings) have come to symbolize an outward expression of an inward process. The concept of “conscious and willing acceptance of responsibility” has taken the place of “guilt offering”. Amazingly enough, this substitution works! The vast and intricate system of tradition surrounding the making of offerings leads to a very effective psychological framework for reaching closure with others, with oneself, and with God. Especially striking is the fact these issues are first brought up in the Torah in the context of unwitting transgression. The focus throughout this parshah is on mistakes and cases of doubt. There is an important message in this: we seldom know for sure if what we’re doing is wrong. And in fact, it is in just such cases where we feel that we might have transgressed that we are most affected. In such cases, the doubt gnaws at us in ways that it does not when we know we’ve done wrong. Often enough, in the later cases, we aren’t bothered by guilt, simply because we’re in denial. But it’s when guilt first begins to gnaw, when we are on the tipping point between denial and acknowledgement of responsibility, that guilt offerings come into the picture. We are encouraged to take that step into responsibility. Why? Because only by doing so will we be able to take the following step—the correction of the undesirable behavior. Only one who can take full responsibility for his past actions is in a position to change his future actions. If we unintentionally harm another, then the harm is real, regardless of our intentions. The more unintentional the wrong, the more we are likely to feel guilty over it, and thus the greater the need for some kind of closure. The process of Teshuvah (return) and atonement are meant to help us put a stop to the feeling of guilt. It is a process of mourning the road not taken, and like mourning in general, is done in stages. But what constitutes atonement? And why is it even necessary if we had no choice or if we acted unintentionally? In Judaism the concept of atonement is connected with closure; to make an atonement offering represents a kind of “full stop” to an issue involving “guilt” — whether real or perceived. This last point is important; the subjective feeling is just as binding as the objective reality. Traditionally, such an offering could not legally be offered until one had done whatever was necessary and possible to make amends. Making amends is in the objective realm, while the atonement offering is a symbolic gesture intended solely to provide subjective closure. It is a therapeutic tool. 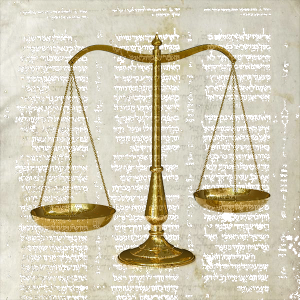 We learn in this week’s parashah that one who did something that he thought was wrong at the time, but which was not actually wrong, is just as obligated to bring an atonement offering as if he had actually done wrong. Further, one who believes that he did wrong, but is not sure, is liable to a greater offering than one who knows beyond doubt. The one who believes—but is not sure—is stuck in a kind of vacillation in attributing the act to his free will. He is still wavering on the brink of “did I or didn’t I? Did I have a choice or not?” I know from experience that this is a terrible place to be. The double offering serves as an emphasis: “Yes I did this thing.” It marks his acceptance of the responsibility quite apart from any other consideration, such as why he did what he did. It allows a kind of closure. One cannot reach closure until one is able to say, “Yes, this is what I did. Yes, it was I who did this.” We identify with both deed and doer, and accept both. In accepting ourselves, weaknesses and all, we reaffirm our own worth. By acknowledging our own responsibility for the consequences of our own deeds (even if unintentional and even if they damaged no one but ourselves) we also reaffirm our status as actors, rather than passive bystanders. In other words, we reaffirm our role as co-creators of the universe.